If self-help and self-improvement books really worked wouldn't more people be helped and improved after having read them? Why don't they work? What's missing from them? Between the covers of this book lies what no author has ever given you... the missing piece to your personal achievement puzzle. With this book, your map is complete and your quest can begin. 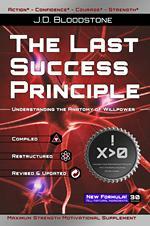 This book will sit close to your fingertips and be the new reference for success in the 21st Century and beyond. Unlike any book in existence, Think & Grow Balls! : How to Shrink Your Fear & Enlarge Your Courage, takes you on a journey through psychology, physiology, spirituality, and individuality. It's written in perfect sequence and has the uncanny power to motivate and encourage you to do anything. Your future awaits. The journey continues. 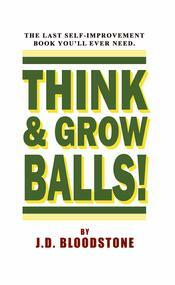 In this highly-anticipated sequel to Think & Grow Balls! : How to Shrink Your Fear & Enlarge Your Courge, you get a deeper understanding of one of the most respected, yet, misunderstood character traits a person can possess... BALLS! What are "balls" and what does it mean to have them? Is it just about having the courage to overcome your fears, or is there more to it? Between the covers of this book lies the answer... given to you in a way that only J.D. Bloodstone can. Follow along with J.D as he metaphorically launches you from the foundation he build with his first book and guides you toward your own escape velocity. Continue your journey through psychology, physiology, spirituality, and individuality as you discover how to unleash your willpower and determine your destiny. Your future awaits. Onward and upward... 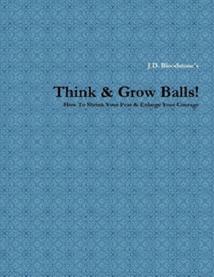 In this highly-anticipated conclusion to Think & Grow Balls! 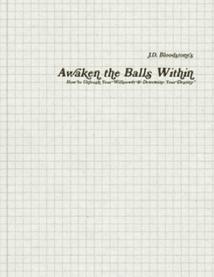 : How to Shrink Your Fear & Enlarge Your Courage and Awaken the Balls Within: How to Unleash Your Willpower & Determine Your Destiny, J.D. Bloodstone gives you a detailed action plan that you can learn and apply in your quest to achieve your goals and life purpose. Using a bold and unique writing style and structure, while incorporating the masterful use of the metaphor, J.D. is able to convey the important message that having knowledge isn't enough, you must actually apply it in your life to gain valuable feedback and insight into how to finally complete your personal achievement puzzle. Between the covers of this book lies the capstone to your self-improvement education. With this modern success manual you can complete your journey through psychology, physiology, spirituality, and individuality as you learn how to flex your mind and engorge your life. Your future awaits. Format: Soft-cover, perfect-bound, 8.5" x 11", & personally inscribed by the author. 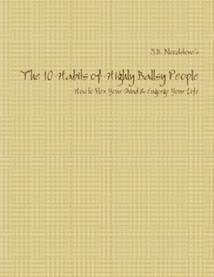 Format: Soft-cover, pocket-sized, perfect-bound, & personally inscribed by the author. PLEASE NOTE: This is not an automated process so please be patient with your order. I will send your digital files via my personal e-mail address within one (1) hour of order confirmation. I will mail all hard copies within three (3) business days of order confirmation. Book prices include free worldwide shipping.